The Center for Natural Lands Management (CNLM) works closely with Joint Base Lewis-McChord (JBLM) and the Department of Defense (DoD) to conserve streaked horned larks and other key prairies species on the base and surrounding areas. EarthFix, the environmental news program on Seattle’s PBS affiliate KCTS 9, just published a digital documentary “Battle Ready: The Military’s Environmental Legacy in the Northwest”, which includes Part 7: Unlikely Refuge, a 6 minute segment highlighting CNLM’s collaboration with JBLM and the DoD to conserve rare species on base. 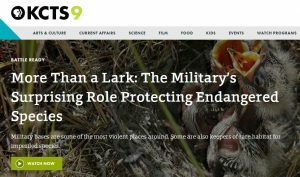 Read the corresponding web article “More Than a Lark: The Military’s Surprising Role Protecting Endangered Species” here, which at the top includes the full Part 7: Unlikely Refuge video and further down includes an embedded 1.5 minute video about CNLM’s seed production efforts and Veterans Conservation Corps members. A related radio story will air in the next few weeks and a TV program will air in February. Stay tuned! Access technical documents pertaining to the streaked horned lark here, in the CPOP Technical Library. The Cascadia Prairie-Oak Partnership (CPOP) is a community of people and organizations that are involved in prairie-oak conservation and species recovery efforts in western Cascadia. CPOP strives to improve outcomes by facilitating increased collaboration, idea sharing and information transfer among the CPOP community. The Cascadia Prairie-Oak Partnership is coordinated by the South Sound Program of the Center for Natural Lands Management. Email ekim [at] cnlm.org for more information. With over 700 members, the CPOP ListServ is a great place to discuss best management practices, share newsletters and publications, and learn about upcoming conferences and workshops.